An Ohio church has apologised after a video emerged of students in a youth programme spitting on, slapping and cutting a pastor at his request. Footage posted on Facebook showed young people lining up to strike associate pastor Jaddeus Dempsey, who intended it to be a lesson on crucifixion before Easter. The video sparked outrage from parents, prompting an apology from Mr Dempsey. Mr Dempsey said he meant to show students "how much Jesus loved them". "I am so sorry for misrepresenting the community, the church, the parents, the students", Mr Dempsey said in a video posted to the church's Facebook page. "It was not my intention, my intention was just to show them how much Jesus loved them." 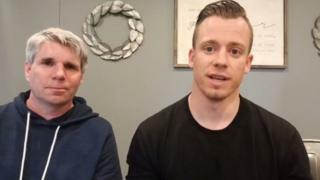 In the video, Mr Dempsey and lead pastor Justin Ross expressed regret over the incident, which took place during a Monday after-school hangout programme at the Impact City Church in Pataskala, Ohio. "Jaddeus got up in front of the students and he says, 'I'm going to ask you to do something that might seem a little crazy, but if there's anyone here that would like to spit in my face, you can do so without any repercussions'", Mr Ross said. Mr Ross said some students "were a little caught off guard", while others were "excited...because they'd never had an opportunity to spit in someone's face'". While some refused, many of the young people accepted the invitation, lining up to spit in Mr Dempsey's face. Mr Dempsey then invited students to slap him. Again, though several students declined, some shouting "no" in the background, several students participated. One male student rolled up his sleeve before issuing an open-handed slap to the pastor's face, as others clapped and cheered in the background. Mr Dempsey then offered students a steak knife, asking to be cut in the back. Video shows him removing his shirt and instructing students on where to place the knife. "He had the opportunity to share a message about Easter", Mr Ross said of Mr Dempsey, "And he chose to use an illustration to explain a very important topic about the crucifixion but the illustration went too far." But for many in the non-denominational church's community, the apology fell short. Though Mr Dempsey said the idea for the lesson was entirely his, other adults including Mr Ross were present throughout the encounter. A 12-year-old boy handled the steak knife and his mother, identified as Mandy, told local CBS affiliate WBNS she received a call from a friend who had seen video online and rushed to pick up her son. "The guy that's in there that's getting spit on, turns around and he grabs the knife and he hands it right to my son", she said. "I was very disturbed." Mandy told WBNS her son will not be returning to the church and that she has reported the incident to the local sheriff's office. While most members of the community expressed concern over the video, others rushed to defend both Impact City Church and Mr Dempsey, who said he has been a student leader for almost four years. "Impact City has amazing pastors, an amazing congregation...and they do so much for the city of Pataskala", one person commented on the apology video. "As wrong as this lesson was, if you look at the whole picture, it is a lesson of what Jesus went through." Image caption A Snapchat video posted to Facebook showed students spitting on associate pastor Jaddeus Dempsey. Holly Collier, who attended Impact City Church for two years said she was "broken-hearted" watching the video. "It was a terrible judgment call," she told the BBC. Ms Collier said her daughter, Kelsey, 16, attended a summer camp led by Mr Dempsey two years ago. "Jaddeus has a very pure heart", Ms Collier said. "I honestly believe he had good intentions." Kelsey told the BBC that Mr Dempsey "is the most fun-loving guy you will ever meet." "Jaddeus and people in that church were always there for us...they're the most understanding, least judgmental people you will ever meet", she said. "I don't think someone should be judged just based on one mistake, that one mistake doesn't define who he is." Kelsey said that three of her friends were at the church that evening, but none participated in assaulting Mr Dempsey. "They didn't take part in it", she said. "It just blew their minds." According to a second post on the Impact City Church Facebook page, a formal review and investigation has now been launched by the board of directors. "Our pastor is making himself available to meet personally with every student and their parents who were present at the student gathering on Monday", the post read. "Our staff will be reaching out to these families as soon as possible."